Europe's new heavy-lift rocket has failed on its maiden flight. The Ariane 5-ECA blasted off from the Kourou spaceport in French Guiana at 1921 local time (2221 GMT) and exploded over the Atlantic three minutes later. Sources close to the launch site have told BBC News Online that first indications suggest a failure of the rocket's main Vulcain-2 engine, as its performance was seen to reduce dramatically before the vehicle veered off course. The rocket's payload of two satellites, valued at more than 600m euros, was also destroyed. All Ariane 5 launches have now been put on hold, which threatens next month's daring Rosetta mission designed to land a spacecraft on a comet. According to our sources, it seems that after the rocket's two solid-fuelled boosters separated from the core stage, the pressure of the liquid fuel entering the Vulcain-2's combustion chamber was less than expected. 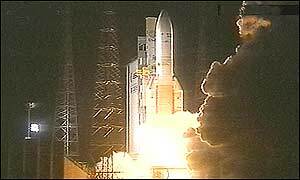 The effect became apparent three minutes into the flight when it was clear the Ariane 5 was not gaining the required altitude or speed. Seconds later the vehicle's self-destruct mechanism activated. The Vulcain-2 engine is supposed to power the rocket for the first nine minutes of flight. The debris from the rocket, and its dual satellite payload, fell into the ocean. Arianespace, the rocket's operators, have scheduled a media conference for Thursday. Wednesday's launch was the second attempt to get the Ariane 5-ECA airborne. The first countdown on 28 November was halted because of a computer glitch. The launcher was a beefed-up version of the vehicle that first went into full commercial service in 1999. Wednesday's explosion was the fourth failure, and the second total loss of an Ariane 5 rocket in its 14-mission history that goes back to 1996. The enhanced Ariane 5 has a payload capacity of 10 tonnes, as opposed to the standard Ariane 5 capacity of six tonnes. This is achieved by increasing the performance of its rocket motors by about 20% and incorporating better fuel pumps and bigger fuel tanks. A new cryogenic upper stage has also been included in the enhanced Ariane 5 concept. The setback has put an enormous question mark over Europe's upcoming science mission Rosetta, which was built to put a lander on Comet Wirtanen. The Rosetta craft was due to launch on the next Ariane 5 flight on 12 January. Its eight-year journey to the comet requires the probe to be swung around Mars once and Earth twice to get it in the right position to catch the comet. This means Rosetta has a tight 20-day launch window. If it is not despatched during this time, it is likely the spaceprobe will have to be directed towards another comet. There are several other possibilities but astronomers would be dismayed to rule out an encounter with Comet Wirtanen. The Ariane 5 launcher lost on Wednesday was carrying two satellites: a Hotbird TM7 for the European telecoms consortium Eutelsat, and Stentor, an experimental communications satellite for the French space research institute CNES. The Eutelsat had an estimated value of about 250m euros; the Stentor was said to be worth 380m euros. Both were insured. The CEO of Arianespace, Jean-Yves Le Gall, immediately apologised to his two customers. "At this stage it is too early to give precise reasons for this failure," he said. "Our job is difficult. It's at moments like this we are cruelly reminded of it," he added. "We have already known failures, we will know more." "Everything seemed to be working normally"
"It is too early to give a clear explanation"
"It's going to be another bad hit for the space insurance industry"